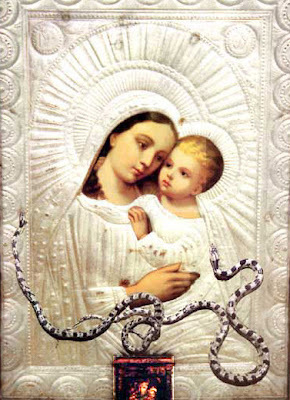 The following excerpt is from my study titled The Holy Snakes of the Virgin Mary: Examining the Mysterious Annual Appearance of Snakes in Kefallonia, which is available for purchase here. Because this miracle was so localized to the village of Markopoulo and the surrounding island, we only have stories of the contemporary villagers based on oral tradition and eye-witness accounts to rely on for its history, together with the few archives of the Metropolis of Kefallonia and government records. The first significant moment of this miracle in the 20th century took place in 1924. Whereas previously all Orthodox Christians followed the Julian Calendar, a Pan-Orthodox Congress gathered in Constantinople in 1923 to propose a canonical update for the calendar to the more accurate Revised Julian Calendar. This caused tremendous confusion and protests amongst the pious faithful throughout Greece, many of whom considered this a disguised anti-Orthodox innovation rather than a mere correction. The residents of Kefallonia were not exempt from this confusion. Because they could not make up their minds, they decided to leave the issue to the guidance of the All-Holy Virgin through her tiny snakes. Since the snakes come out yearly during the specific days of August 6th to the 15th then disappear, they wanted to see if the snakes this particular year would come out during the normal Old Calendar reckoning or according to the New Calendar, a thirteen day difference. To everyone’s amazement the snakes appeared according to the New Calendar reckoning, confirming in their conscience the will of God. For this reason the entire island followed the New Calendar with a clear conscience.